Eiffel Tower to be surrounded by 8-foot high bullet proof glass walls as France copes with series of terror attacks. Thick walls of bullet-proof glass eight feet high will surround the famous tower, which was constructed by the company of engineer Gustave Eiffel for the 1889 World's Fair. 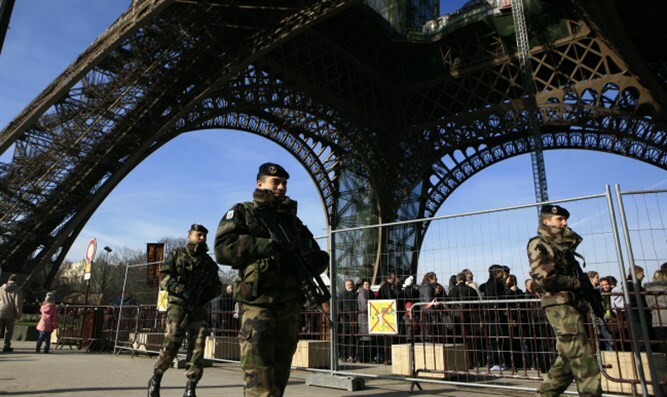 "The terror threat remains high in Paris and the most vulnerable sites, led by the Eiffel Tower, must be the object of special security measures," said deputy mayor of Paris Jean-Francois Martins. 'We have three aims: improve the look, make access easier and strengthen the protection of visitors and staff. "The wall will prevent individuals or vehicles storming the site visited by six million people each year." The glass walls will replace the metal fence erected around the tower in 2016 for the Euro soccer championships. The French newspaper le Parisien reported that the project would cost approximately 16 million Euros ($17 million). 238 people have been killed in Islamic terrorist attacks in the last two years. 130 people were killed in the November 2015 Paris attacks, and 86 people were killed in Nice last summer when an ISIS-inspired terrorist drove a truck into a crowd celebrating Bastille Day. The decision to construct the protective walls around the Eiffel Tower comes after a terrorist attack at the Louvre Museum last week, when a terrorist attempted to stab French soldiers at the entrance to the famed art museum.